You hit something head-on or at an angle. The damage is only in the front end of your car, right? Society of Collision Repair Specialists Vice Chairman Kye Yeung, also the owner of European Motor Car Works, demonstrated through crash test videos last week at SCRS and Collision Industry Conference events just how energy moves through a vehicle — sometimes to the point that a left front impact can affect the right rear of a vehicle. Crash energy flow is an important part of vehicle design — it can help make the difference between a top IIHS or NHTSA crash-test rating and being costly to insure, or worse, unsafe. But the concept also means that drivers, insurers, and estimators might inadequately assess crash damage if they’re not careful. Estimators only often “just look at the point of impact,” Yeung told the SCRS open board meeting Tuesday. (See presentation here and videos below.) But that’s incorrect, he said. For example, Yeung highlighed video of the next-generation, aluminum, unibody 2017 Audi Q7, which smoked the IIHS’ crash tests and earned a Top Safety Pick+. Pay close attention to the roof and other areas away from the front of the Q7 during the small-overlap crash test to see the movement of the crash energy. Yeung noted the right rear quarter panel takes energy from a left front impact. Also, pay attention to how the SUV’s passenger area remains intact. “Look at how safe that occupant area is,” Yeung said.. 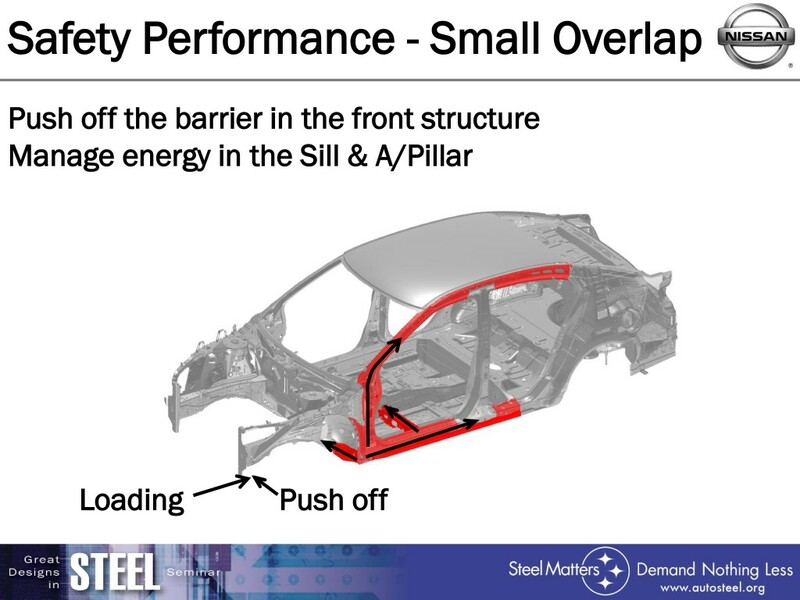 This one wasn’t in Yeung’s presentation, but here’s another unibody example of energy management, this time from the 2016 Nissan Maxima, which also received a Top Safety Pick+. The OEM described its efforts at the 2015 Great Designs in Steel. 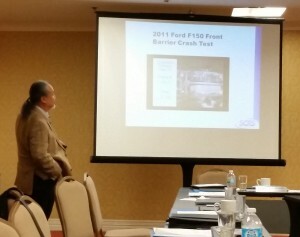 Yeung highlighted the changes in design to the Ford F-150 between the 2001 and 2011 model years with more crash test footage, demonstrating both the trucks’ collision performance and energy movement. “It’s night and day,” an audience member viewing the crash test footage said at the SCRS meeting. And, just because we figured you were wondering, here’s footage of an 2016 aluminum F-150 moderate-overlap crash test. Not only is the customer potentially at risk, the omission can lead to embarrassing or legally costly situations should a reinspector discover it. Yeung last week highlighted a $438,000 verdict against a North Carolina shop accused of negligence in delivering an inadequately repaired Land Rover LR3. “Pretty scary stuff,” he told the SCRS audience. The same logic applies for a customer or insurer who relies on merely photos to appraise damage — safety, liability, and short-pay concerns all arise. An insurer might also miss out on an early opportunity to total a vehicle rather than encounter a more expensive situation where a repair is initiated and then discovers the total-worthy damage. Unfortunately, this kind of thing doesn’t get done as much as it should by collision repairers — and insurers might be hesitant to pay for it, Yeung indicated. The old adage held that 2-3 hours of setup time was needed, according to Yeung. “It’s not realistic,” he said. 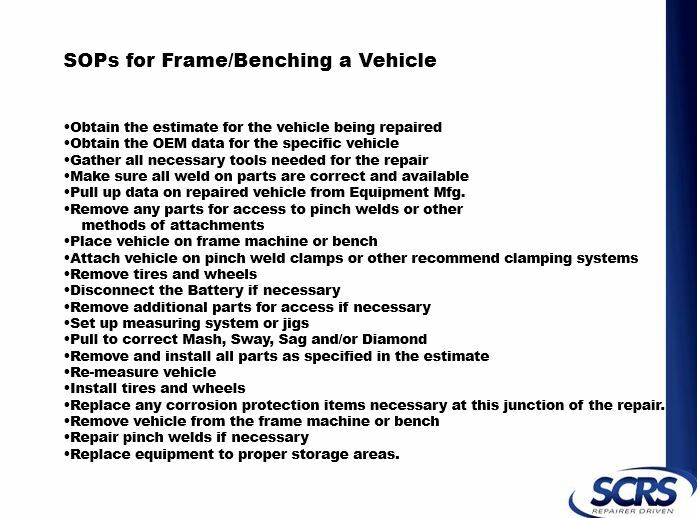 Nor was a single estimating service line item of “set up and pull,” he told the Collision Industry Conference at a similar presentation Thursday. “Line items are quite a bit more than ‘set up and measure,'” he said. This could be implemented in conjunction with a repair plan and map, such as involving the damage worksheets provided by Chief. That’ll have more success convincing a reluctant insurer or out-of-pocket customer than if estimators at a shop “just grab numbers,” Yeung said in the SCRS talk.